Season ticket holder Richard Mason will unfortunately miss Reading�s first ever season in the Premiership � in June he is cycling to China and back in aid of Cancer Research UK, covering 20,000 miles and 27 countries. As part of his fundraising efforts the club kindly sorted out a signed shirt, which is now being auctioned on e-Bay. Every penny of the highest bid will go to Cancer Research UK. The shirt incorporates 19 signatures, and also the league sponsor badges from Coca-Cola. The auction closes on 05 April at 9pm. To find out more about Richard�s trip, and to sponsor him, visit his website at 2 Wheels to China. Fans Celebrate "Best Day Of Life"
Celebrations seem set to continue for the rest of the season after Reading were promoted to the Premiership with six games of the season still left to play. Saturday's 1-1 draw with Leicester City sparked huge celebrations at the Walkers Stadium with 3,000 Reading fans staying behind long after the game to pay tribute to the players and management. When fans eventually dispersed from Leicester, the party carried on later in Reading town centre with John Madejski rumoured to be touring the Reading pubs to celebrate in style! The party will continue at a sold-out Madejski Stadium on Saturday as Reading look to claim the Championship title when Derby visit. The club have pencilled in "official" celebrations to take place on bank holiday Monday 1 May, when the season is wrapped up with Reading top of the pile. An open top bus is expected to run between the Madejski Stadium and the town hall to give everyone in Reading the chance to join in the celebrations. Fans have been expressing their opinion on Hob Nob Anyone? about Reading's amazing season - John Madejski, Steve Coppell and his team, and all the playing staff deserve all the praise that is flooding their direction. Over 70% of fans have voted that Saturday was the "best day of their lives" on the Hob Nob Anyone? discussion forums - more popular than the promotion success at Brenford in April 2002 and way ahead of wedding days! Eventually attentions will start to turn to next season - Reading's first in the top tier of English football. The bookmakers will no doubt expect Reading to struggle against the International stars of the Premiership - but we'll worry about that later. The Royals are 5/2 to finish in the top half of the table next season and 5/1 to finish in the bottom half. With Steve Coppell at the helm we can expect plenty more pleasant suprises next season. Congratulations all round, and let the party continue. We are Premier League. Latest Championship Table - ROYALS ARE UP! Promotion To Be Sealed At Leicester? Reading could seal promotion to the top flight of the English leagues for the first time in the club's history this Saturday. Leeds United, who still retain a slim mathematical possibility of catching the Royals, did Reading a massive favour by losing 1-0 at home to Crystal Palace last night. The result means that a win for Reading at Leicester City this Saturday would guarantee Reading promotion to the Premiership - regardless of other results. A Reading win could also seal the Championship title if Sheffield United lose at home to Southampton. The Royals could also seal promotion with a draw if Watford and either Leeds or Sheffield United fail to win - even a Reading defeat could see promotion confirmed if results involving the three chasing sides go our way. If promotion isn't confirmed this weekend it almost certainly will be next weekend as Reading face Derby County at the Madejski Stadium - with plenty of the season still remaining to celebrate. The Royals are going up. Wolves secured a point with an impressive second half performance in a lively fixture at the Madejski Stadium. Reading looked set to march to yet another win after taking the lead mid-way through the first half when John Oster did very well on the right to cut in and cross to Convey. Convey seriously buried his shot to put Reading 1-0 up, with a powerful drive into the roof of the net. The Royals then had a series of chances to increase their lead but only went in a goal up at the break. Reading still looked the more likely team until Wolves drew level just after the hour mark. The game lost it's shape until Wolves emerged as the time most likely to steal a victory in the last part twenty minutes. The visitors had a couple of chances to win the game but Reading stayed level to secure a fair result on the day. Watford took a point away from the Madejski Stadium this weekend, and ended Reading's run of ten straight home league victories, as the game ended goalless. The visitors worked hard to stop Reading playing throughout the ninety minutes, by quickly closing us down, tackling hard and leaving little space for Reading to get going. They clearly had come for the point and in the end just about deserved it after an impressive defensive performance. Going forward Watford offered little with ex-Reading player Henderson having no impact. While Reading struggled to create any clear chances in the second half, we might have wrapped up the win by half time. Kitson, Convey, and Sonko all had chances in some goalmouth scrambles, as Watford managed to keep Reading at bay. Sonko looked certain to score from close range as the ball came over but somehow failed to make contact. Reading also had a penalty turned down after Doyle was held back in the area as he looked to run through for a certain goal. Both sides continued to play the game at a fast pace in the second half but despite plenty of effort, neither side looked likely to find the winner. Reading's inevitable journey into the Premiership took another big step with another straight forward Championship victory - this time a 3-0 win at Burnley. The home side offered little resistance to Reading, who didn't have to play their best football to win with ease. The victory was marred by injuries to striker Leroy Lita and winger Glen Little, with Lita suffering a broken ankle that will rule him out of action for at least the rest of the season. The result was never in doubt after Bobby Convey put Reading ahead after just ten minutes with a superb individual goal - blasting the ball into the top corner of the net from distance. Reading had to wait until the fifty-fifth minute to move further ahead when a free-kick from the left was soundly headed home by Sonko in the centre. Little was heavily involved in the game after replacing Oster near the start of the second half. Another Little cross almost created a repeat goal when Sonko again nearly got onto the end of it with his head. On 83 minutes Little limped off to be replaced by Hunt. Hunt, Reading's third winger of the game, was equally effective as he set up the third in the dying minutes. A good run down the right wing saw a low cross provide Dave Kitson with a simple finish to wrap up the victory. Reading bounced back from their first league defeat in 34 league games - and in doing so ended Preston North End's twenty two game unbeaten run. Reading's return to winning ways came after a tough encounter with play-off contenders Preston at another sell-out Madejski Stadium. The visitors had the better of the second half after putting in a very physical first half performance as they attempted to bully Reading out of the game. The game got off to a lively start with Reading taking the lead after just six minutes. Their goalkeeper, who looked very shaky throughout, failed to claim a cross and as the ball was driven back in he dropped it on the line. Sidwell was well placed to bundle the ball over the line. The lead only lasted two minutes, when Sonko conceded a free-kick on the edge of the area, which was put past Hahnemann with a low drive around the Reading wall. Kitson didn't last the first half after being clattered to the ground as their keeper charged out of his area. He was forced to limp off to be replaced by Leroy Lita. Lita was only on the pitch for five minutes when Doyle played a great ball through and Lita latched onto it before driving a perfect shot across goal and into the far corner from a tight angle. Reading were forced to defend in the second half to maintain their lead. Sidwell was another casualty and was replaced by Gunnarsson on the hour, and Reading were then on the back foot. Thankfully both full backs were in good form - particularly Murty who had to scramble a couple of efforts clear from close to the goalline. Preston started to struggle to break through but there was a worrying finish as Preston enjoyed all the final pressure - luckily with no end product. A new unofficial club song is being released tomorrow. We've received a copy of the CD and the press release that follows on the link below. The song will be avilable to buy from 27th February, with a percentage of profits going directly to Reading FC through Hob Nob Anyone? The song is being released initially for download only, and a short sample is available for preview. If you like it you'll soon be able to buy on-line. Please note that this song is not officially endorsed by either Reading FC or Hob Nob Anyone? So it�s finally happened. We all would have preferred it to have happened at Stamford Bridge or Old Trafford in the latter half of 2006, but the unbeatable team have finally been beaten. After the game at Brammall Lane last Tuesday night, where the Royals managed to emerge from the game with the record still intact having faced an onslaught of Sheffield United chances, and having the luxury of missing a penalty, it actually seemed possible that, for this season anyway, the team couldn�t lose. However that team that played against the Blades looked nothing like the team that took the field at Kenilworth Road three days later. For the first time this season the players looked tired and off the pace. Not once in his eight year spell at Reading have I seen Graeme Murty go on a gallant sprint down the touchline and run out of steam half way, but it happened on Friday. Sheffield United and Watford both picked up three points today to close the gap on the Royals at the top of the table. United's 2-1 victory over Wednesday saw them move to nine points below Reading with the same games played. Watford won 1-0 at Brighton but, despite the extra three points, remain nineteen points behind Reading with eleven games left to play. The only other team with any chance of catching Reading is fourth placed Leeds United. There was good news there after they could only draw 1-1 draw with Leicester City. Leeds United and Watford both need to pick up approaching two points a game more than Reading for the rest of the season to move above us. Although perhaps not mathematically, just three more wins should almost certainly be enough to see Reading promoted to the Premiership. Reading's amazing run of 33 league games without defeat finally came to an end against an impressive Luton Town. 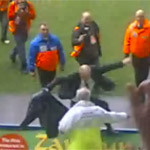 The Royals' run started after the opening day defeat against Plymouth Argyle in August 2005, and Luton Town became the only home side this season to beat Reading on their travels. There could be no complaints about the final result as Reading were shocked into defeat by a well prepared and determined home side. The reason for defeat was simply a rarely superior opposition on the night. However, there was no doubt that Reading missed Glen Little and Steve Sidwell who were both rested. It all looked so promising for Reading early on - Kevin Doyle's opening goal within the opening twenty seconds put Reading as firm favouries to march to another win. Luton were quickly back into the game. A good passing move resulted in the equaliser on twenty minutes. It was the kind of football we're used to seeing this season - just not from the opposition. There were some question marks over the defence when the second goal went in just six minutes later. Marcus Hanemann would have been disappointed after charging off his line when he should have let Sonko deal with it, but Luton were cutting through with ease. The decisive goal came from the boot of former Reading player Dean Morgan, six minutes into the second half. Morgan ran wide across the defence and into the middle before driving his shot sweetly into the bottom corner leaving Marcus stationary in the middle. Luton had the game won and now concentrated on denying Reading any space to start playing football. Tackles were fast, effective and fair, and for once Reading were short of ideas. It seemed unlikely we could get back into the game until the last minute. Hunt did very well on the right to shrug off a couple of players, before twisting and turning and delivering a perfect cross. Doyle sneaked in front of Kitson and headed home to make it 3-2 to set up an interesting few minutes of injury time. However, we couldn't find the goal to continue the run, and if we had it wouldn't have been a fair outcome. Reading took another big step towards confirming promotion to the Premiership by securing a point at second placed Sheffield United. The draw saw Reading retain their twelve point margin over their nearest rivals, and confirm their status as the team set to collect the Championship trophy at the end of the season. This was an excellent result for the Royals, but it could have been even better for Reading if Dave Kitson had converted his last minute penalty. Right at the death Reading might have snatched the win after Bobby Convey was taken down in the area by the United keeper, but he saved the spot-kick to ensure the points were shared. The draw was probably the right outcome after both sides might have grabbed the decisive second goal. Both of the games goals came early on, and the goalscoring was completed with twelve minutes on the clock. United took the lead when a clever pass saw Dyer score from twelve yards out. Three minutes later, and Reading were back level when Convey did well down the wing to cross for Kitson in the middle. Kitson, starting in place of Leroy Lita who was ruled out after an incident in a Bristol nightclub on Monday, had a straight forward finish from close range to make it 1-1. The home side then enjoyed the better of the play but struggled to convert their chances. Marcus Hahnemann was once again in fine form in the Reading goal with a string of good saves to keep the scores level. Reading's closest rivals, in the race for automatic promotion to the Premiership, both dropped points today - leaving Reading even further clear at the top. Second placed Sheffield United failed to score as they drew 0-0 away at Plymouth Argyle, leaving Reading twelve points clear in first place. Both Reading and United have thirteen games left to play, meaning United need to earn a point more for every remaining game to overtake the Royals. Meanwhile Leeds United also played out a goalless draw with Derby County. Leeds may have a game in hand on Reading but they are a massive 23 points behind. Watford managed to win to move to within 21 points of the Royals with the same games played. But with the season running out, just a handful of wins will see Reading confirmed as a Premiership side. Another straight forward victory saw Reading cruise to a 2-0 victory over Southampton tonight. The Saints weren't the worst side to visit the Madejski Stadium this season but they lacked Reading's quality and ability to play fast effective football. Reading got off to the sharper start, with Southampton rarely getting past the half way line. Southampton's defensive weakness was exposed in the sixteenth minute when Reading moved ahead. The ball was played through the defence to Little on the right, who always looked second best to meet the ball. The defender appeared to slow up leaving Little a gift, to cut inside and play a straight forward low cross to Lita. Lita, despite having three Southampton players in close proximity was left with a easy tap-in from close range to put Reading on their way. Southampton hit back with an effective attack of their own as the ball was played through leaving a clear run on goal. Hahnemann came off his line, but the forward had the whole goal to aim at before somehow managing to roll the ball wide of the far post when he looked certain to score. Moments later a cross into the box saw a clean header appear to beat Hahnemann before coming off the corner of the post and crossbar. If that was bad luck for Southampton, more was to follow seven minutes before the break. Hahnemann pumped a long ball upfield and Doyle intercepted it while surrounded by red and white shirts on the edge of the box. His control was spot on and the keeper must have been unsighted as Doyle rolled the ball just inside the post to make it 2-0. The goal might have been against the run of play, but it was far being from a suprise. We expected Southampton to come out fighting for something in the second half, but it never appeared. Instead Reading looked calm and collected as time drifted away. We threatened to increase the lead but there wasn't much urgency in the game as both sides seemed content with the 2-0 score-line. At full time, it was another excellent result for the Royals that sees them pull thirteen points clear of second placed Sheffield United. Reading suffered a rare defeat - just their third of the season - as a heavily changed team made an FA Cup exit at Birmingham City. Reading's reserve side put in a good first half performance and, despite being a goal behind at the break, had looked the better side. Reading's early superiority saw Kitson nearly put Reading ahead in the opening five mintues but he saw his shot roll just wide of the far post. The game became scrappy before City got a lucky break, against the run of play, just after the half hour. Forssell ran through and saw the ball bounce off Stack and then take a very luck bounce of Reading defender Halls to allow him to scramble the ball over the line. Reading came to life and immediately came forward with their best period of the game. Sidwell hit an excellent shot from outside the area that struck the foot of the Birmingham post before the rebound presented itself to Kitson once more. Kitson should have buried it but hit the ball straight at the keeper in the middle of the goal as an easy chance slipped away. Just into the second half, Reading got the deserved equaliser when City failed to deal with a long ball over the top that bounced into the area. Hunt did very well to get between two defenders, head the ball down, and then turn before hammering the ball into the back of the net off the underside of the crossbar. At that moment Reading looked favourites to go on and win, but in reality it was our last real positive input to the game. City stepped up a gear and Reading faded out as we struggled to contain their attack. A City goal was always on the cards and it came on 67 minutes when the cross from the right found Halls out of position in the middle. City's Gray had a free header to put the home side 2-1 up and on their way to the next round. Reading came from an early goal down, and despite letting in three goals, came away with yet another league win after hitting four past Crewe Alexandra. Crewe's achievement was quite something - Reading had only conceeded six goals away from home in fifteen league fixtures before today. The side rooted to the bottom of the championship played some good football in a highly entertaining fixture, but Reading retained the upper hand to record 31 consecutive matches without defeat and move within three games of setting a new record for the second tier of the English league. Despite Reading's league table superiority of 54 points before kick-off, Crewe made a lively start and after hitting a post moved then ahead within fifteen minutes. Hahnemann saved but couldn't hold the ball and the rebound was stuck home from close range. Reading spent ten mintues behind before Shorey drew Reading level with his second goal of the season, a free-kick, and his second in two games. Moments later Reading were ahead when Little did well down the right to send over the perfect cross for Sidwell to head home. Crewe's heads failed to drop and they were nearly back in the game before the break when Hahenmann neaded to make a good save. Instead of pulling level, the home found found themselves further behind before half time when Shorey found Lita inside the area who finished with style. After half time carried on in a similar pattern with chances at both ends and both keepers being called into action. It was Crewe who scored the next goal when Hahnemann again made a save but was helpless with the rebound. Crewe's hopes were immediately dashed when Reading made it 4-2 and put the game seemingly out of Crewe's reach. Convey's cross from the left got the slighest touch from Lita in the middle to send the ball into the net for Lita's second. Crewe were allowed a glimer of hope when Shorey's arm made contact with the ball in the area and Lunt scored from the spot to complete the scoring. Lunt then saw red as he picked up a straight red card for a clumsy challenge on Hunt. However, down to ten men, Crewe still finished the last few minutes stronger as Reading had to scramble the ball away in the dying moments to hang on for the full three points. Reading's unbeaten Championship league run hit thirty games tonight as Reading swept aside Norwich City at the Madejski Stadium. The first team was back in action again as the Royals continued their league form with a 4-0 demolition - two goals in each half. Norwich offered little resistance, despite creating a few good chances of their own. In defence they looked weak and every Reading attack caused panic that suggested more Reading goals. The win was well underway in just six minutes when Doyle won a free-kick which Nicky Shorey drove home from the edge of the area. Just after fifteen minutes Little crossed from the right and Sidwell met the ball in the middle as the Norwich defence remained static, and it was 2-0. Reading appeared to have taken their foot off the pedal for a while, but ten minutes after the break the win was wrapped up when Doyle caused more confusion in the Norwich defence. With two men on him he turned one way and then the other before somehow creating plenty of space to put in the cross. Lita met it in the middle for a simple goal from close range. Convey netted the fourth with a great run from the middle of the pitch. Doyle ran across him and pulled the defenders away and Convey neatly broke through the defence to fire a low shot into the Norwich net. The Royals had more chances to increase the score and Norwich missed a sitter themselves - but it was Reading's night once again with an excellent performance across the whole side. Reading will face Stoke City in the fifth round of the FA Cup if they can overcome Birmingham City in the fourth round replay. The Royals drew 1-1 at the weekend with Birmingham at the Madejski Stadium, meanwhile mid-table Championship side Stoke defeated Walsall 2-1 at home. Should Reading reach the fifth round, then the game will be played on Saturday 18 February with the Royals travelling to the Britannia Stadium. Birmingham City and Reading will have to play out an FA Cup replay after the sides drew 1-1 at the Madejski Stadium in the fourth round of the competition. Reading fielded a nearly full reserve team, making eight changes from the team that drew at Crystal Palace in the league. Meanwhile, Birmingham lined up with a near full strength team showing their intentions of reaching the next round. Despite City's superiority on paper, Reading enjoyed the best of the first half and deserved to be a goal in front at the break. Shane Long gave the Royals the lead on the half hour mark after an excellent Reading move saw James Harper thread the ball through to Long on the right. Long's finish was quality as he tucked the ball between the goalkeeper and the near post. The turnaround came in the second half after a triple substitution by the visitors saw them get a tighter grip on the game. Stack in the Reading goal made a couple of first class saves to keep Reading ahead but City pulled level with over twenty minutes left to play. Birmingham looked more likely to take the win towards the end but struggled to produce much more in front of goal, and the draw was probably a fair result. The replay will take place on Tuesday 7 February at St. Andrew's with the winner facing a team to be determined in Monday's fifth round draw. Notes from last week's STAR (Supporters' Trust At Reading) Fans' Forum, held at the Madejski Stadium, are now available on-line. The forum allowed fans to put their questions directly to members of the team, and over 300 STAR members were present to hear the responses. Bobby Convey, Kevin Doyle, Marcus Hahnemann and Steven Hunt were on the receiving end of a range of questions - including the team spirit, Leroy's shorts and Sonko wearing his pants on the outside. For more details read on! Reading came from a goal behind, as two late goals saw the Royals and Crystal Palace battle out a 1-1 draw at Selhurst Park. The result allowed both sides to stretch their unbeaten runs and saw Reading stretch their run to 29 league games without defeat as they maintained an uncatchable 25 point margin over fifth placed Palace. Following the FA Cup heroics from the Royals during the week, it was back to business as normal as Coppell switched back to his "league" starting eleven. It was the home side that got off to a better start and they could have moved ahead in the opening few minutes after a Shorey back pass went wrong, allowing Palace striker Johnson a clear run at goal. Thankfully Marcus Hahnemann showed the form he has been enjoying all season long, and was to repeat throughout the night, as he came off his line to block the shot and make the first of many vital saves. Down the other end, Kitson nearly put Reading ahead as he somehow managed to get inbetween the defender and goalkeeper to lob a shot just over the crossbar. Kitson failed to find many clear cut chances as Reading started to get more into the game, and on a couple of occassions he nearly made contact but failed to connect. After a impressive first half of football from both sides, the second half started a bit more scrappy until the game came back to life once more. Palace had penalty appeals waved away after Ingimarsson appeared to put his hands in front of the ball, but a penalty was awarded just a couple of minutes later when Johnson won himself a penalty, which he fired in. The goal saw Reading step up a gear and carve out yet another fantastically constructed goal. A determined Murty battled himself through down the right to cross. Lita, who had come off the bench just fifteen minutes early, did very well to flick the ball through to Harper in the centre of the box. Harper buried the ball into the back of the net as Reading put the game back on equal terms and both sides had to settle for a fair share of the points. Reading have confirmed the signing of Stoke City defender John Halls for �250,000. The fee is expected to rise by a further �50,000 when Reading achieve promotion to the Premiership, and the deal includes a sell on fee should Halls move on in the future. Halls will provide cover in the right back position but is currently recovering from injury and so is not expected to feature as the Royals travel to Crystal Palace tomorrow night. The player was linked with moves to both Southampton and Crystal Palace before the Royals secured his signature. Halls began his professional career with Premiership side Arsenal - making three league cup appearances off the substitute's bench. In December 2003 he signed for Stoke City after a successful loan spell before quickly establishing himself in the first team. On a night that promised little, with two sides fielding heavily changed sides, Reading fans were entertained by an FA Cup treat as the Royals came from two goals down to beat Premiership West Bromwich Albion 3-2. Leroy Lita stole the headlines with an excellent hat-trick, but it was a fantastic all round team performance from a Reading side with seven changes. Reading had the better of the first half but somehow managed to find themselves two goals down at the break. The second half saw Reading play some excellent football as they made the visitors look very ordinary. Reading were sharper, more determined, and simply a stronger side throughout the game and never gave up despite going two goals behind. The Royals were quickly back in the game on 51 minutes when Oster crossed and Lita turned inside the box to fire home. Fifteen minutes later and Reading were deservedly level when Lita was played through again and he scored with a delightful long range effort that flew over the keeper and dipped perfectly into the net. Reading looked clear favourites to win the game but had to wait until extra time to score the winner when Harper broke into the box. Harper might have scored but failed to connect, and the ball came loose to Lita who legged it through before driving the ball home for his third. Birmingham City will visit the Madejski Stadium for the fourth round fixture after they overcame Torquay United 2-0 in their replay last night. Reading stretched their lead at the top of the Championship table to nine points as two Dave Kitson goals gave Reading victory over Coventry City at the Madejski Stadium. Second placed Sheffield United could only draw, while Leeds United were defeated as Reading pulled a massive 21 points clear of third place. Reading's seemingly unstoppable march towards the Premiership continued with another deserved win - that stretched the unbeaten league run to a crazy 28 games. However, Coventry City were far from a push over and Reading needed Marcus Hahnemann to be in top form to pull off a string of excellent saves to keep Reading ahead in the second half. The Royals had the best of the first half without causing too many problems for the visitors but immediately stepped up a gear after the break to move ahead. As soon as the half started, Convey's run ended with a great through ball to Kitson. Kitson ran on goal and pushed the ball past the on-coming goalkeeper to put Reading a goal up. The goal saw Coventry come to life with a strong spell of pressure on the Reading goal, in which they were unlucky not to pull level. Hahnemann made three top draw saves in the space of five minutes, and was beaten once when the crossbar came to Reading's rescue. Reading put the game out of Coventry's reach and ended their resistance twelve mintues from time when substitute Stephen Hunt created the second. Hunt went on a great run down the left wing, cutting in, turning and leaving his defender on the floor to play a perfect low cross to Kitson in the middle. Kitson was left with a simple effort from close range to seal the victory. The winner of the third round replay between Reading and West Bromwich Albion will face either Torquay or Birmingham at home in the fourth round of the FA Cup. The Royals drew 1-1 with West Brom on Saturday, while Premiership Birmingham City drew 0-0 at League Two strugglers Torquay United. Reading's replay with the Baggies takes place on Tuesday 17 January at the Madejski Stadium. Reading will have to replay their third round FA Cup fixture against Premiership West Bromwich Albion after the sides shared a 1-1 draw at the Hawthorns. Reading made six changes to their starting eleven but never struggled against a near first choice home side. The game was scrappy at times, especially during the first half, but the second half saw Reading edge the game. West Brom should have gone ahead in the first half when they hit the post and somehow managed to miss the rebound from a few yards out. Kitson could have put Reading ahead but the home keeper made an important save. The game looked to be heading towards a 0-0 draw until Makin was judged to have pushed a West Brom player to the ground, and the resulting penalty was put past Stack in the Reading goal. With Reading determined to take something from the game at the end, the reward came from a clear hand ball down the other end just two minutes later. Kevin Doyle drove the penalty home to make it 1-1 - a reasonably fair reflection of the game, although Reading will be disappointed having not wrapped up the win in the dying minutes. The replay will take place at the Madejski Stadium on Tuesday 17 January 2006. The Royals enjoyed a very successful festive period as the previously familiar festive slump failed to appear. Instead, the Royals marched on to complete a run of ten straight league wins with two 2-0 victories at Wolves on Boxing Day and against Leicester City at the Madejski Stadium three days later. The busy Christmas and New Year programme was wrapped up by securing a point at Derby County on New Years Eve before a stunning 5-1 demolition of Cardiff City on Bank Holiday Monday. Reading came closest to losing the unbeaten run, that started after the opening day of the season, with a close run result at Derby County. In the Sky televised game, Shane Long came off the bench to make only his second Reading appearance and headed home a vital equaliser that made it 2-2 with just two mintues left. A Reading goal had looked on the cards after Derby were reduced to ten men with twenty minutes left to play. The sending off gave Reading a much needed boost, and although the Royals could have gone on to win the game, it would have been harsh on the home side. After few chances for either side Derby went ahead on the half hour, only to see Reading immediately equalise through a Kevin Doyle header after a Little cross from the right. Derby were back in the lead on the hour mark, but were up against it after the red card, and Long's goal came when Sidwell played the ball back into the area. After securing that point, the Royals were back to winning ways on Monday with a big win over Cardiff City. City came to play some good football but were swept aside by a Reading side in top form. It was a massively entertaining game with Reading playing some excellent football as they created chance after chance. Sidwell scored his first after just eleven mintues from Little's cross and Shorey's cross allowed Sonko to head home to make it 2-0 at the break. The second half saw Kitson score from close range and Sidwell score his second with his head with Cardiff pulling one back inbetween. Kitson completed the scoring with Reading's fifth from the penalty spot. Sidwell nearly completed his hat-trick with a superb effort that smacked against the post, and Cardiff were lucky to escape without conceeding more.